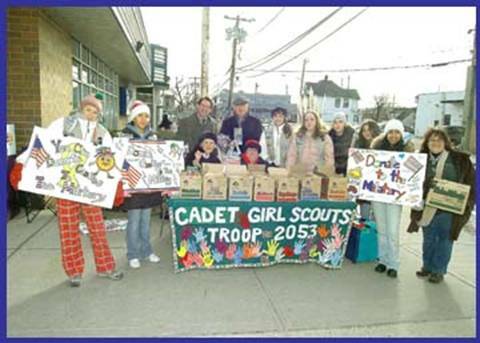 Nassau County Legislator Fran Becker joined with Girl Scout Troop 2053 recently as they held a cookie sale in front of the Valley Stream Post Office to help support the U.S. troops stationed overseas in Iraq. The Girls Scouts accepted contributions from members of the community which will be used to send Girl Scout Cookies to our troops overseas. Shown in photo, from left to right: Kristen Wraith, Sana Shafi, Legislator Becker, Mary Ann Cahill, Mayor Edward Cahill, Girl Scout Leader Joann Scola, Melanie Pavels, Danielle Infantino, Christine Schaefer, Sara Pergola, Nathalin Gil and Lorraine Pergola.